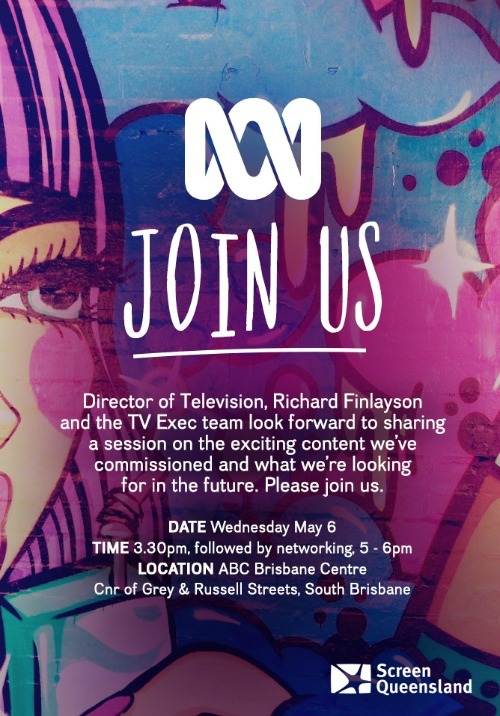 Screen Queensland invites you to ‘Meet the Broadcasters’ – ABC on Wednesday 6 May 2015, 3.30pm – 6.00pm at the ABC Brisbane Centre, South Brisbane. ABC TV aims to be the home of Australian stories. 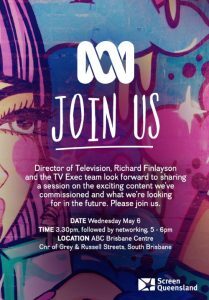 This session is a great opportunity to meet the ABC TV team and learn more about what they are looking to commission and how to pitch new ideas. Location: Paid parking is available in the South Bank Parklands Underground Car Park. The car park is accessible via Tribune St and Little Stanley St, South Brisbane. The closest public transport options are the South Brisbane train station, Cultural Centre bus station or the CityCat (South Brisbane terminal).